How prominent is sexism in professional tennis? Historically, women have earned less than their male counterparts throughout society. The issue of pay inequality between males and females has sparked heated discussion within the tennis community. It was not until 2007 that all four major Grand Slam tournaments awarded equal prize money in both male and female draws. 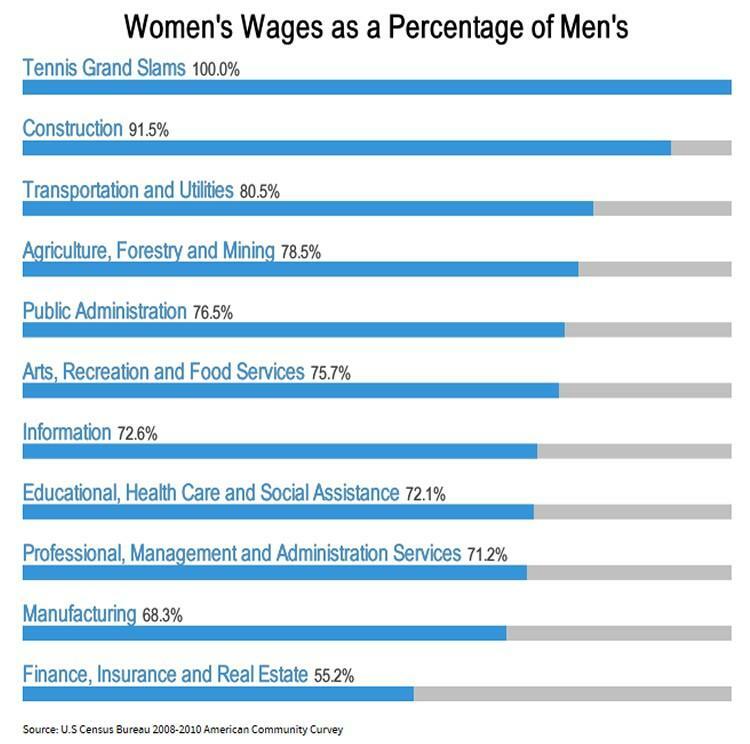 Using Business Intelligence and data visualization, we can track progress towards equal pay in professional tennis. How well has Wimbledon addressed the gender pay gap? Wimbledon was the last of the Grand Slam tournaments, along with the French Open, to move to equal pay for both genders in 2007. Considered to be one of the more prestigious events on the tour, Wimbledon only enacted equal prize money 39 years after the ‘Open Era’ began in 1968. So what took the globe’s most recognised tennis tournament so long to catch up? Perhaps Wimbledon’s penchant for tradition also resulted in the sustained lingering of ‘old school’ gender bias? By contrast, the US Open led the charge for equal pay (1973), with the Australian Open following suit early in the new millennium (2001). While we can see that this parity achieved in 2007 still remains today, the years leading up to it saw a gross imbalance in pay. In 1968, males were being awarded more than double that of female champions (62.5%). Though significant progress was achieved in the first 10 years of the Open Era (narrowing the pay gap by 52.5%), a consistent differential in gender-based prize money remained at Wimbledon. From 1977 until 2000, the women’s singles champion still received 10% less than her male counterpart at the All England Club. It was not until the 21st century that successful and respected names of the sport, such as Billie Jean King and Serena Williams, truly helped instigate change to eliminate these sexist attitudes and close the gender pay gap. To understand how the Wimbledon gender pay gap was closed, it’s useful to compare the increase in prize money by gender over time. While total winnings have continued to increase at substantial rates for both genders post-1980, it was over three years (2001, 2005, and 2007) where the change in women’s prize money exceeded that of men’s in order to reach prize money equality. This graph also clearly indicates the increasingly lucrative nature of the modern tennis industry – for men and women, particularly over the last decade. With growing exposure through media, advertising and sponsorship, will these figures continue to rise at this exponential rate? And, with the marked growth in third-party endorsements for, and audience pulling power of, female stars such as Serena Williams and Maria Sharapova, is it possible that prize money for the women’s draw could exceed the men’s draw in the foreseeable future?